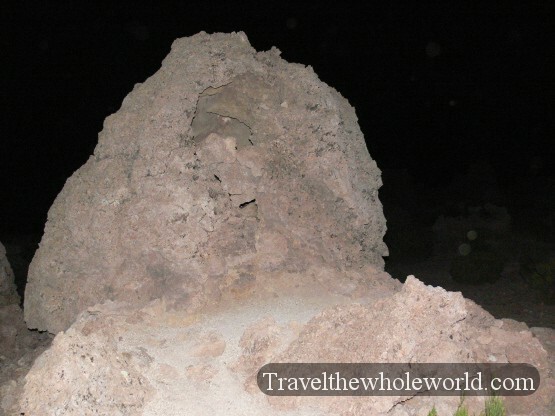 Outside of the salt pans in another part of southern Bolivia, I was lucky to get a local tour at night of some ancient cemetery. I didn’t really understand what I was going to see, but this was one of the most interesting parts of my trip to the country. First we came to some very strange coral formations in the desert. The guy with me said that this used to be underwater so they formed ages ago. The upper right block is actually hollow and he told me to look inside. I looked inside the hole in the coral and on the left is what I saw. The dozens of strange coral formations were turned into tombs and all had skeletons inside of them. On the right is another skeleton from another coral formation, while most had only one body some of the coral formations shared two skeletons in one hole. 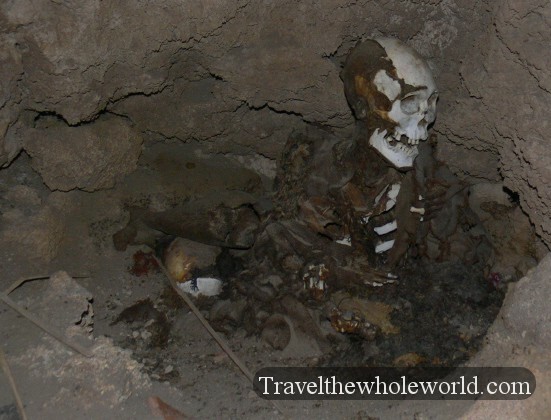 I was told these skeletons were from after the Tiwanacu times but before the Inca. 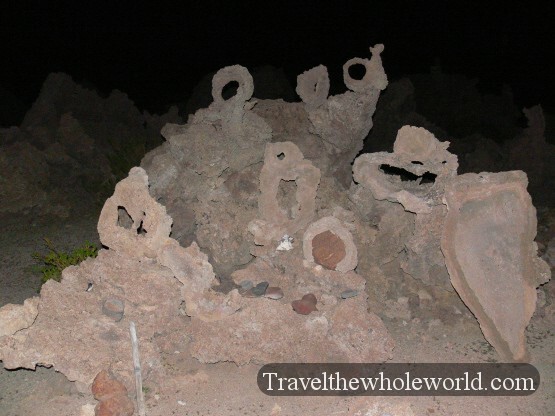 They were put into the coral formations and the holes were covered with clay which eventually eroded away. 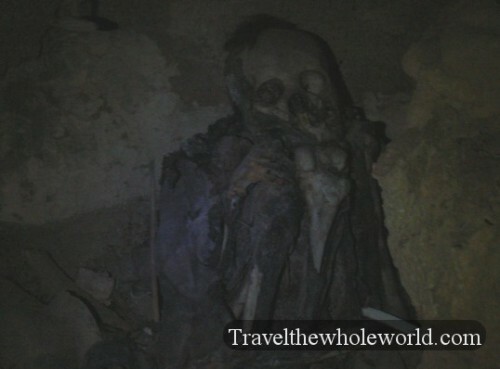 This place was only discovered a few decades ago, and initially all the tombs were broken into to search for treasure. I’d assume that they were buried here after they died, but look at the first skeleton on the upper left. He has is back against the wall, knees to his chest with one arm around his legs and a hand on his right knee. There is no way dropping a body in a hole is going to land like that, so either he was propped in the position or was buried alive and sat like that until he finally died. This area doesn’t seem to be known to archaeologists so I couldn’t find out any more reliable info online. Back to the rest of southern Bolivia: we passed through a desert known as the Dali desert which is very close to the border of Chile. It was named after Salvador Dali’s paintings which some though resembled this area. 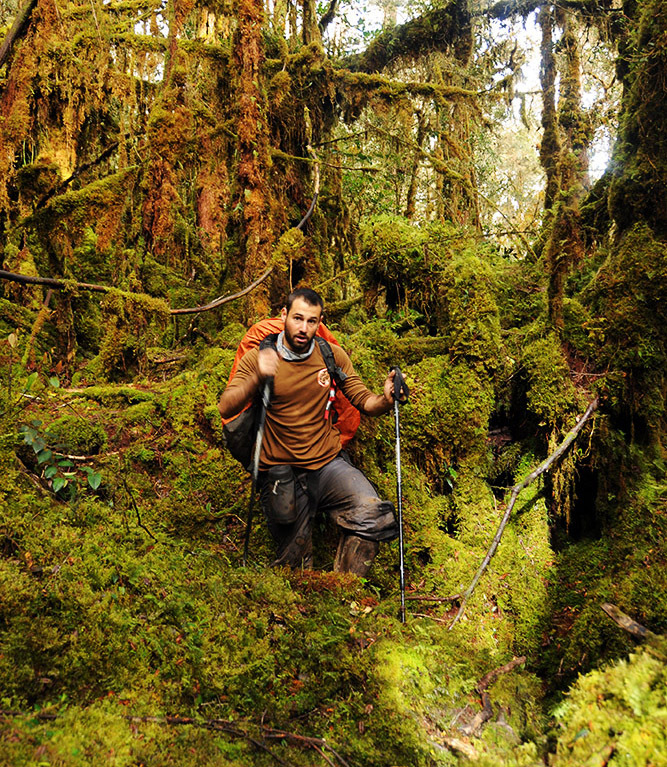 Other parts of the desert are rocky with huge formations of moss. The moss formation on the right has nothing to give you perspective but if I stood next to it would be almost as tall as me. I saw some lizards and other species of birds here but missed getting any decent photos. On the left is a photo of me in the Bolivian desert, still very close to the border of Chile. The altitude at this point was over 4,000 meters, or over 13,000 feet. Some people have altitude problems at this height, but coming from Aconcagua the altitude wasn’t much to me. I did however get either a nasty stomach virus or curse from the skeletons that I took photos from the night before. For the next week or so I was pretty sick and had a lot of stomach pains, but no fever or headaches. Despite being sick, I still went out and was able to take some photos of wildlife though, like the fox on the left and a picuna on the right. There are also large herds of llamas around here, and some type of Andean bear. I’m not sure exactly at what altitude the bear lives at, because the desert is so dry and lifeless I wouldn’t know how a bear could survive in such an environment. At 4,300 meters you will find several lagoons, some of them are fresh water which is how most of the wildlife can survive in this desert. The water is supplied by melting snow that comes of some of the higher altitude mountains. The water on the left is able to support life, but the green lagoon on the right is made of copper and arsenic, so it is deadly to both people and all animals. It does provide some great scenery. This lagoon above is called the red lagoon, or laguna colorada in Bolivia. The red here is made from a type of algae which flamingos in the area live off of. 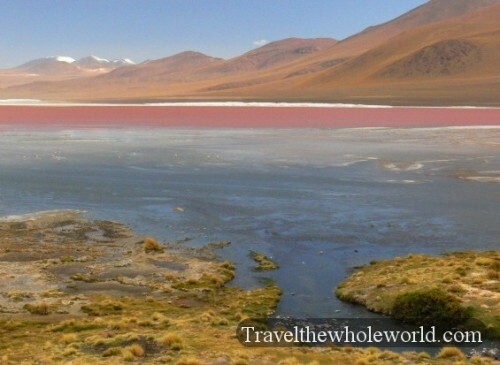 The algae here gives the flamingos their reddish color, just like shrimp turns flamingos pink other parts of the world. The flamingos on the left were pretty far away so I didn’t get any good or clear shots, but they are the ones living in the red lagoon. I saw other flamingos in some of the other lagoons as well. 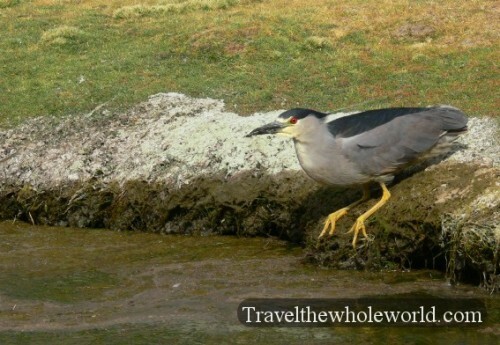 The large bird was actually along a river at a lower altitude, not sure on the species. 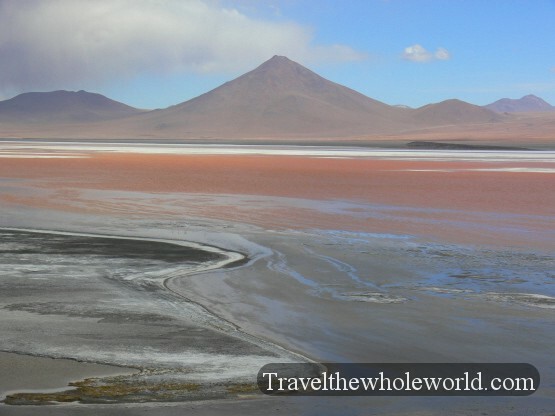 The southern part of Bolivia has so many amazing things, but to top it off it even has geysers and thermal springs of a variety of different minerals. Most of this area is steaming and smells strongly of sulfur. You can find boiling mud, pools of oil or liquid red iron which is lava seen in the photo on the right. The boulder on the left was a photo I took during sunrise as steam vents from the ground behind it. The area didn’t always smell so good because of the sulfur but it was definitely scenic, especially in the early morning. Another favorite spot for tourists in this area is the hot springs that you can actually swim in. The hot springs are an easy way to warm up if you’re willing to jump in. Outside its freezing temperatures, but the springs are like a jacuzzi.